The Washington Capitals stole the series lead late against the Pittsburgh Penguins on a clutch Alex Ovechkin goal to take the 2-1 series lead. The series stays in Pittsburgh for one game as the Penguins will have the opportunity to regroup and tie up the series against a tough Washington team. The first period ended in zeros because of the great play of Braden Holtby and Matt Murray in goal for their respective teams. Both teams came out flying as the intensity is always heightened in this rivalry, but both goalies weren't having it. There were five power plays in the period, two for Pittsburgh and three for Washington, but neither team was able to convert. At the end of the first, Washington was a perfect 24/24 on killing penalties in the playoffs. Both teams definitely tested the goalies but both were brick walls in the first with Murray stopping seven shots and Hotlby stopping nine. They kept both of their teams in it as they went to locker tied 0-0 and it looked as if it may be the night of the goalie. The second period was jam-packed and definitely the best period of the game. It saw five goals scored all of which were pretty great and Pittsburgh go into the third with a 3-2 lead. John Carlson got us started just 48 seconds in on the power play to give the Capitals the 1-0 lead. He shot a laser by Murray as the beautiful passing on the man advantage led to the shot and the goal. Washington began to pour it on and just when it seemed like Pittsburgh couldn't answer... they did. With 15:27 left on the clock, Jake Guentzel did what Jake Guentzel does best. Justin Schultz tip-toed along the blue line to keep the Penguins in the zone then passed over to Sidney Crosby who then teed up Schultz for the shot which was beautifully tipped by Guentzel to put it past Holtby to tie the game. With Crosby's assist, he tied Ray Bourque for 13th on the list of most playoff points. After the goal, the Pittsburgh Penguins now had new found life and all of the momentum seemed in their favor especially after Brooks Orpik got called for a hooking penalty to give Pittsburgh their third power play of the night. After seven straight power plays with nothing to show for it, the eighth time was the charm. Patric Hornqvist made it 2-1 in favor of the Penguins off a nice heads-up play from Evgeni Malkin. Phil Kessel had the puck along the boards and was getting squeezed so he passed to Malkin who drove to the net and passed it over to Hornqvist who flipped it up over Holtby top shelf for the goal. After hard work from the Hornqvist/Kessel/Malkin line, Pittsburgh was holding onto the lead with 13:11 still showing on the clock. After the goal, that's when controversy arose. 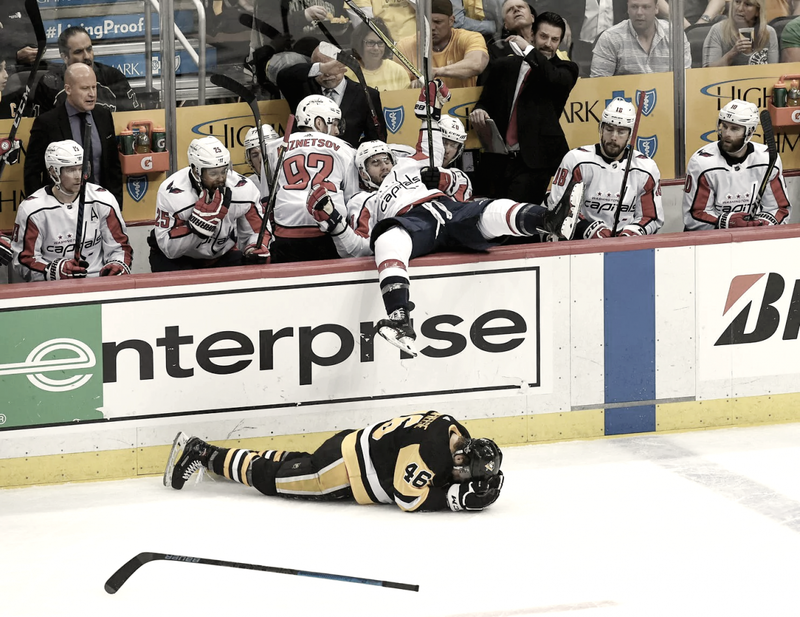 Tom Wilson absolutely annihilated Zach Aston-Reese next to the Capitals bench. Aston-Reese was down for a time but he was able to slowly skate himself to the bench where he was immediately taken to the locker room. That's when tempers flared. There was no penalty called as it looked like Wilson hit Aston-Reese square on the check with his shoulder and it looked like Wilson left his feet as well. Pittsburgh was pretty upset by it and all throughout the period, Wilson was the target of attack. It really started to get heated after the Caps tied the game at two. After the game, Pittsburgh head coach Mike Sullivan had this to say on the incident, "We lose a guy to a broken jaw that's going to require surgery and a concussion because of another high hit to the head. At some point, we would hope that the league might do something." Chandler Stephenson got his second goal of the postseason from an ill-advised turnover by Jamie Oleksiak, which was caused by great forechecking by Niklas Backstrom. He was able to poke it to T.J. Oshie who found Stephenson in the slot ready to slap home the one-timer to tie the game at two. The Penguins wanted to respond and after a rush of their own, tempers flared once again with both Crosby and Ovechkin at the heart of it. Ovechkin gave Pittsburgh a power play because of a cross-checking minor which he received when he pushed Crosby into the boards completely on purpose. Pittsburgh did have a glorious chance to take the lead off a shot that dribbled through Holtby's pads, but it was swatted away at the last second by a diving Matt Niskanen to keep the game tied. Ovechkin came out of the box, and Pittsburgh once again walked away empty handed from a man advantage. After a 4-on-4 which resulted in nothing for either team, Jake Guentzel showed up again. A turnover by the Caps led to Crosby finding the puck on his stick which is never good for the opposing team. Crosby saw Guentzel all alone on the left side of the ice. He rocketed a pass through three defenders and Guentzel fed it through the legs of the defender that stepped up on him to himself and he was able to find Crosby for the one-timer. An absolute beauty of a dangle gave Pittsburgh the 3-2 lead. Sidney Crosby collected a firm grasp on the 13th spot of all-time playoff points, and Jake Guentzel got his eighth goal of these playoffs as well as extending his point streak to 15 points in seven games. Things got chippy again, but nothing became of it as both teams headed to the locker room with a 3-2 score in favor of the Penguins. As the intensity was definitely heightened, both teams came out flying. It was truly a game of runs and right when it seemed like one team had all the momentum, the other would gain it right back. Even though both goalies allowed goals, they played well for their teams and it could have been a lot worse of a score if they hadn't. The Penguins wanted to expand on their lead but after pressure by the Caps, they let one through. Matt Niskanen fired home a laser from the point to tie up the game with 14:54 left to play. Murray did make a save on it, but Niskanen shot it just hard enough that Murray couldn't get all of it and it flipped over his pads into the goal. The game was now tied with a series lead on the line. Both teams tried their damnedest to get one of the opposing goalies to break, but they just wouldn't. Right when it seemed like another game in these playoffs was headed to overtime, that's when tragedy struck for Pittsburgh. With just a little over a minute left to play, Alex Ovechkin hushed the Penguins' fans as he tapped a rebound off a Backstrom shot to give Washington the lead in the game and the lead in the series. Ovechkin became the hero of Game 3 for the Caps and delivered a clutch goal. Pittsburgh was stunned as they watched the Caps take the win on their home ice and saw Washington capitalize as they were just left out in the frozen tundra. After the game head coach Mike Sullivan had this to say on the game-winning goal, 'It was unfortunate bc we had pretty good momentum at that point in the game. We had our top line out, the other team was tired, we had an extended zone shift. It was disappointing but that's part of the game. We have to do a better job." He's right. Pittsburgh got saved by Murray too much and in the end, it cost them. They played too loose against a very good Washington Capitals' team that seems different than in years past, and they were too focused on Wilson and not the game. It's an unfortunate outcome for them as they did play a pretty good game otherwise, but Washington looks more legit this year than in years past and if Pittsburgh doesn't change then they are going to lose this series. Pittsburgh will look to avenge this loss as they will play once more at home before going back to Washington. They take on the Caps again from PPG Paints Arena Thursday, May 3rd at 7 P.M. EST. Do you think the Caps take the 3-1 series lead on Thursday? Do you believe in the Penguins? Tell me in the comments below!